The R20 is one of the models Ravin takes pride in, as it offers the cutting edge technologies the manufacturer strived to develop for years with excellent results. If there is a crown jewel for this well-known company, the R20 might just be it. Using unique technologies, it manages to deliver speed, precision, and power, all in the same package. Speaking of which, you will get more than just a crossbow with your purchase. The fact that there are extras such as arrows and a scope to complete your kit shows you why this rather expensive model has its fair share of supporters. There are two things about crossbows that make you believe that you must always strike a compromise. Any crossbow that is made from highly durable materials tends to be heavy which means that portability is sacrificed. But you won’t have to make any such sacrifices if you pick the Ravin R20 as its stock is made from cast polymer, a detail that allows it to be lightweight, without giving up on durability. The injection molding processes used to create the forearm makes it so reliable. You will like the fact that everything from the pistol grip that makes you feel like you are shooting a rifle when you’re using it, to the safety wings that let you keep both hands under the flight deck, is built with your comfort and durability in mind. Its unique design makes this particular model stand out from the crowd. The bolt doesn’t traverse the rail when you fire, as there is something called the Frictionless Flight feature in place. Regarding design, that means that the arrow will touch the crossbow in just two places, one being the string, and the other the dual rollers. What happens when you’re making use of this design is that you will enjoy great accuracy. Plus, the string and cable will live longer, which means that you’re making a sound investment in this model. The sleek profile of this bow makes it a win among consumers. It has only six inches in width when cocked, so handling it from a cramped place, such as a tree stand or a small blind, is possible. Such versatility will convince you that the Ravin R20 is a force to be reckoned with. Also, the low weight, at just 7.1 lbs, is one of its selling points, as many hunters like to have the ability to carry their weapon of choice around without fear that they might end up straining their hands. The beautiful Gunmetal grey paint also draws points in favor of this model. You will get more than just the crossbow when you’re ordering this package. The manufacturer includes six arrows that will allow you to start shooting right away. The 13-inch power stroke enables the development of speeds of up to 430 fps and kinetic energy of 164 ft-lbs. 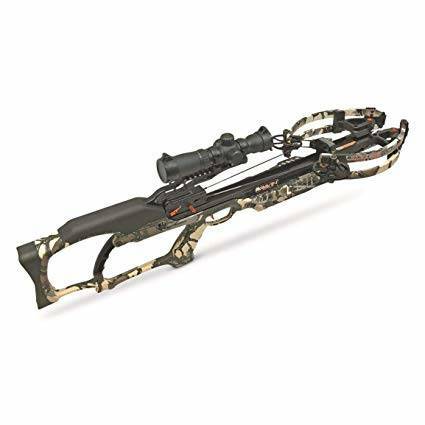 No matter what prey you want to take down, it will be impossible not to deliver excellent results, if you are armed with this outstanding crossbow. Equipped with the HeliCoil technology, the R10 is well balanced and is a reliable companion when out in the field. The manufacturer sends it entirely assembled and pre-tuned, and you don’t have to worry about having to fiddle with it to make it work. You will also get an excellent range of accessories with your purchase, besides the arrows mentioned earlier. The package includes a removable cocking handle, a quiver with its mounting bracket, and an illuminated scope. Because it has a cocking mechanism, you will not have to take the entire draw weight upon yourself. There are also some safety measures in place that you will like. You will not risk any early shots due to the anti-dry fire mechanism available. Talking about overall quality, it must be mentioned that the optics installed on the model is one of the crucial advantages offered by the Ravin R20. The 1-8x24mm scope comes with fully multi-coated optics which means that you will get a good picture through it even when you have to hunt in low light conditions. As far as noise dampening systems are concerned, the Ravin R20, again, leaves nothing to be desired. Because of the HeliCoil design of this particular model, you will not experience unneeded sound and vibrations. However, we must mention that you can expect fast crossbows, such as this one, to make a bit of noise. Here, despite the unique technology used, the Ravin R20 doesn’t particularly stand out. However, seeing how fast you’ll send your arrows flying, your target will not have a chance to react. 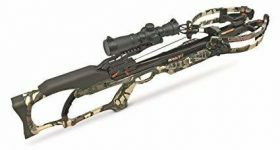 You can hardly get any better than the Ravin R20 when it comes to purchasing a full crossbow package. The superior speed, the outstanding kinetic energy, as well as the precision delivered, are all reasons to consider this fantastic weapon. It is compact, and it weighs less than competing models, even when fully equipped with the needed accessories. Whenever you have to take down large animals, you can count on the Ravin R20 to deliver as promised.